With the online retail sector growing quickly, so is the competition for that increased revenue and growth. Now more than ever, online retailers recognize that it's not only vital to drive shoppers to their sites, but also to ensure that they stay and make online purchases in growing numbers. The key to increased conversions is optimizing the online customer experience — and what was once an art, is now just as much a science. 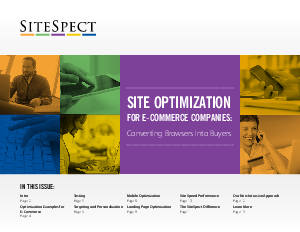 By leveraging the latest optimization technology, leading online e-commerce companies are now dynamically testing content, graphics, offers, layout, and functionality to gain new insight into the experiences their site visitors prefer. They're seeing what works and what doesn't, using valuable data from their testing to make site changes to improve the online shopping experience, increase customer loyalty, and convert more browsers into buyers. Learn more by downloading this free e-book today.